Be sure to book with a licensed rental so that you have a place to stay when you arrive. All legal rentals list their license number. 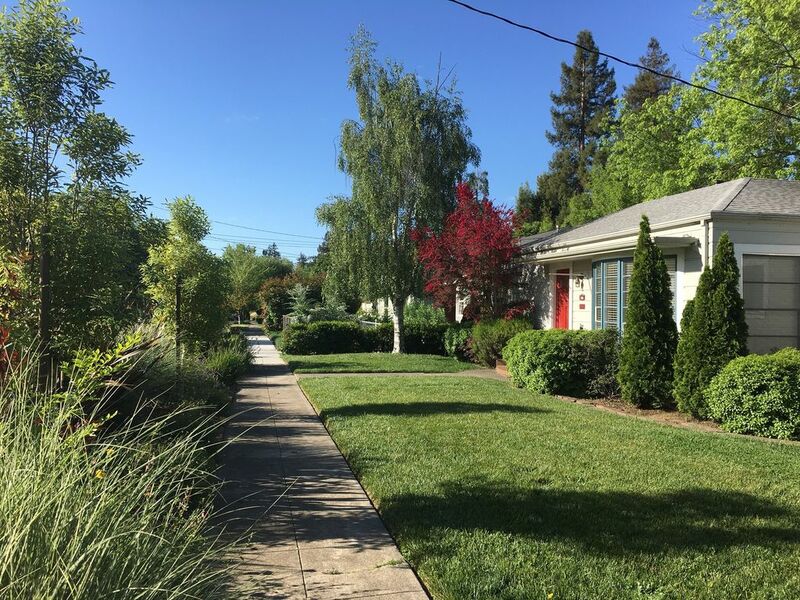 Enjoy the good life in one of Napa's finest neighborhoods. This is a tastefully restored 1940's bungalow home with everything you need to enjoy your sun-filled days in comfort and relaxation. The home includes floor-to-ceiling windows, nice landscaping, and great outdoor living with a large backyard, gas BBQ, deck, maple trees and a picnic table. And we just upgraded to a new central heating and air system to keep you the perfect temperature year round! Built by Napa legend Devita, the home is light, airy, and open - a perfect vacation getaway. This house sits on a corner lot on a quiet tree-lined street. The backyard is fully fenced with locking gates. The fence is covered with vines, keeping it private and quiet. French doors open from the dining room and master bedroom to the deck and backyard, looking out through trees to the Napa hills. You'll enjoy comforts ranging from a plush king bed in the master bedroom, to the flat screen TV in all rooms, a movie library, books, magazines, Apple TV, so you can access your music or rent a video, all hooked up to the Bose system, endless cable channels. Cook your dinner in the fully equipped kitchen. Use the wine cooler to keep your wines the perfect temperature during your stay. Relax sipping Cabernet on the deck looking out at the stars. Take one of the bikes or go for a walk to downtown. The house provides full amenities including high thread count cotton sheets and towels, soaps, shampoos and bath salts. A computer with cable internet is available for last minute planning. Or bring your laptop and surf wirelessly from the couch or lounge chair in the yard. The house is 1.4 miles away from downtown Napa. Located at the foot of highway 29 and the Silverado Trail, everything is close and easy to find. Drive 45 miles south to San Francisco and spend a day in the city. Our visitor's guide provides maps and suggestions for local dining and wine tasting. There is also information on nearby tennis, mountain biking, road biking on Mt. Veeder, a gym with a pool, steam room and sauna, parks, outlet shopping, world class restaurants and more. Interested in a longer stay? We have an adorable sister property which offers monthly rentals at great rates. Hi, thanks for browsing our vacation rental. We purchased this property in Napa in 2007 as an investment, and to have a place to get away from the city. The wine country, with its perfect climate and beautiful scenery season to season, is a great place to do just about anything you like, and this house is close to everything. The Devita Bungalow is a great place to enjoy barbecues in the private backyard as well as dining at the many nearby world class restaurants, and, of course, visiting all the nearby wineries. We chose this property due to its indoor/outdoor feel, the wonderful light with all the windows, the quaint, safe, and friendly neighborhood, and the comfortable back yard to relax in. Heater and also wood burning fireplace. Tennis raquets available to borrow. A large selection of CDs old and newer music. Many favorite movies on DVD. Also an Apple tv and Netflix so you can rent movies through your accounts. Rent kayaks and paddle down the Napa river. French doors open to backyard deck from dining room and mater bedroom. 12 tennis courts free at Napa Valley College a half mile away. Courts are almost always available. Two tennis rackets provided. Fully fenced yard with locked gates. Free use of 2 house bicycles and tennis rackets. We thoroughly enjoyed our stay at the Devita Bungalow- it was perfect for our girls weekend getaway. The house was clean and very well appointed. Michelle really thought of everything guests might need which was very helpful. The beds were extra comfortable and the bedding was top notch as well. Would definitely recommend staying at the Devita Bungalow!! This bungalo is a gem! We loved our stay in Napa at the Devita Bungalo. Hosts Michelle and Penny have thought of everything to make the stay special, from coffee and cream and a fully equipped kitchen, to bikes and helmets, guidebooks galore, and a basket of toiletries in case you left anything at home. The decor is simple and beautiful with very comfy beds and everything was immaculately clean. Our favorite was hanging out on the back porch drinking wine and watching the sunset. And finally! A rental house with plenty of wine glasses. Thank you for a perfect birthday weekend! Perfect spot to relax after a day of wine tasting! Thanks to Michelle and Penny for sharing their lovely home! It was exactly as advertised and full of all the extra things you have to go buy or you forget (like toiletries, basic spices, kitchen supplies, etc). Even though we didn’t use the bikes, we did take a walk to Fuller Park, shopped at Oxbow market and downtown Napa. All are conveniently located to this property. All of the rooms were larger than expected, nicely furnished (really comfy beds) and the backyard is very private and relaxing! This was our fourth trip to Napa and the third VRBO we have rented. It was very well priced and one we would consider again! Very fast and efficient booking, check-in and check-out too! Outstanding bungalow and very relaxing. We arrived on a Thursday and followed the instructions to enter . The House was in the perfect location since my sister lived a couple blocks nearby. We actually walked to her house on a couple days and also to the local park. Being able to walk to local convenience store was nice as well. The house is about a 10 minute drive to downtown Napa which can be walked but we always took our car. Only issue we had was we could not get the main TV to work but the other two sets worked fine. Having A/C was nice since during the day, we had to deal with 80+ temps. One of the bikes had a flat but we never had time to use them since we had several family plans we attended. When we come back to Napa, I hope we can stay here again. This is a great vacation house! It is appointed with every extra you might need. The backyard is fabulous and has a nice grill for cooking outside. The addition of air conditioning since we stayed here last is only one of the reasons we will be staying here again. Thanks to Michelle and Penny! The Devita Bungalow is near downtown Napa, a little over a mile away. It is quite a nice walk, or bike (use the house bikes) from the house. Downtown Napa has many restaurants, wine tasting rooms, a scenic walk along the river and more. Three nights minimum over the weekend. No smoking anywhere on the property.